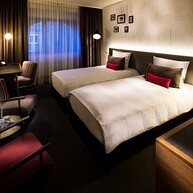 In order to discover Leuven in all its facets, you can avail of a whole array of accommodation options. There is something for everyone: small and medium-sized hotels, intimate and distinctive bed and breakfasts as well as budget-friendly youth hostels. A warm welcome is guaranteed! All addresses are within walking distance of the bustling city centre.